Before his marriage to (and subsequent collaborations with) Catherine L. Moore, Henry Kuttner was a frequent contributor to the pulp magazines that specialized in the weird, supernatural, horror, and science fiction genre. Beginning in 1936, Kuttner launched a steady stream of short stories aimed at Weird Tales, Strange Stories, Thrilling Mystery, and others. Kuttner and Moore were married on June 7, 1940 in New York with artist Virgil Finlay as Best Man. With NYC as his base of operations, Kuttner interfaced on a frequent basis with the major local genre editors: Leo Margulies at Standard Magazines (Thrilling Mystery, Thrilling Wonder Stories, Strange Stories,), Alden H. Norton at Popular Publications (Astonishing Stories, Strange Detective Mysteries) and perhaps most importantly, John W. Campbell, Jr. at Street & Smith Publications (Unknown / Unknown Worlds). 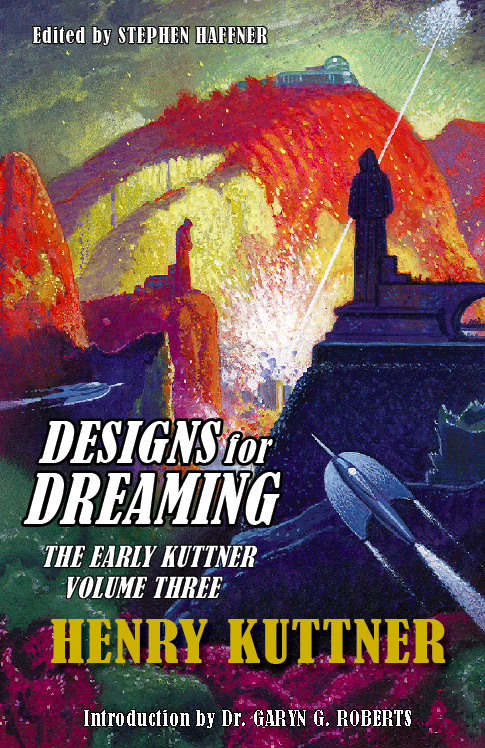 Campbell’s Astounding Science Fiction will loom large in Kuttner’s career for the next decade. In DESIGNS FOR DREAMING (the third and final volume of “The Early Kuttner”) Kuttner sells the last of his stories to the weird-menace pulps, places some SF stories with lesser markets (Stirring Science Stories and Fantastic Adventures), and delivers some of his finest fantasy work in Unknown Worlds. By the summer of 1942, Kuttner’s Draft Status was reclassified as 1-A. By April 13, 1943, Pfc Henry Kuttner had orders to report to Fort Dix, New Jersey. The early phase of Kuttner’s career was over.